This past year has been a year of major transformative growth. Whether knowingly or not, I managed to attract people into my life who have changed me irreversibly. I'm sitting here in my bedroom/studio right now, half awake from the wear and tear of today, knowing there is much to be said and expressed in this post. I'm fighting with the little energy I have left today to give to the most important thing in my life, my dream (aka my blog, my illustrations, my love of travel, and my connections with all of you). This severely skewed equation of how my time is divided daily, as a result of a demanding full-time job, is perhaps the reason I'm writing this evening at all. Something is wrong with the way I'm living and today and each day forward I need to be my own idol. I came across this particular quote whilst reading the ever honest and admirable Sophia Amoruso's #GIRLBOSS. She writes "I don't want you to look up, #GIRLBOSS, because all that looking up can keep you down. The energy you'll expend focusing on someone else's life is better spent working on your own. 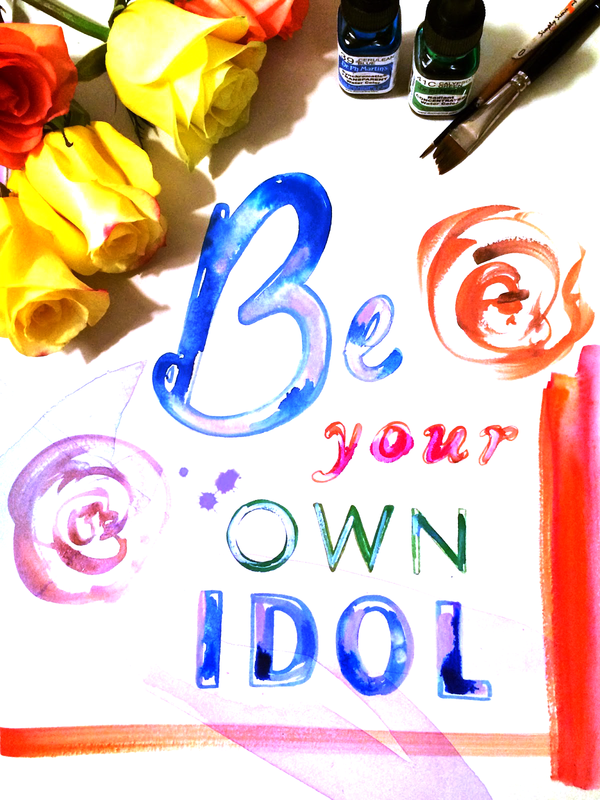 Just be your own idol." And when I read this it hit like a barreling freight train unhinged. I can't count the number of precious minutes, hours, days that I have wasted in my life worrying about what the hell everyone else around me is doing. I have been plagued with the disease of dissatisfaction my whole life. Nothing was or is ever good enough. Starting today, that all changes. What I have come to realize in my young 28 years is that it absolutely DOES NOT matter where you come from, good or bad, because it is up to you to determine where you go from here. There is simply no more time to waste worrying about my circumstances anymore. This is my journey. I own every part of it and if I want things to be different then the change of course can only be led by me. I don't know any other fashion illustrator out there who has branded themselves a traveling fashion illustrator. But just because the category doesn't exist yet, does not mean my brand isn't valid. I realize that in order to live a life of fulfilment I have to be a pioneer, I have to be my own idol. I can't look to illustrators of the past or even my colleagues today. My journey can only be paved by me. Have any of you ever faced a moment in your life where you realized that you had to be your own idol? If so when or how did it happen? My Spring Awakening continues and I would love nothing more than to continue sharing it here with all of you. I am also guilty of wasting time doing this but I found this quote that reminds me you can change your life and behaviour and create the life you want and deserve whenever you want. It's so hard to follow the be your own idol advice, but I feel like it's more important now more than ever in our age of social media. It is so easy to get wrapped up in other people's lives! Jealousy springs up, and I have to remind myself that most people only post on social media their best moments. I have my own life to live, and this year I have been working really hard to keep that mindset. So thank you for the inspiration. It's important to stay on track. I agree with you 100%. Your story can be written only by you and yes! You can be a pioneer, you can invent or reinvent your profession and who you are. I truly believe in that because me too I am at that chapter of my life. Believe! Yes! Everything about this post is Yes! I love that quote and now it makes me want to read #GIRLBOSS even more! I love the idea of focusing all that energy on yourself instead of others! Inspire others instead of worrying about what they're doing! A to the point message. Waiting for a new post of you :) but I think you are on a holiday now as I've seen on Instagram. Enjoy!